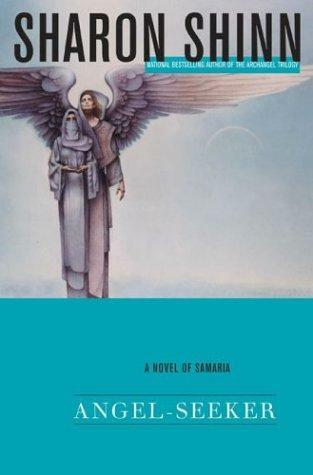 Angels and men exist in harmony on the world of Samaria. Every twenty years, a new Archangel is chosen to govern the land and lead all the people of Samaria in a great musical chorale to honor the god Jovah. But Gabriel, the Archangel-elect, finds himself constantly feuding with Rachel, the bride who has been chosen for him by Jovah—and he is slowly coming to realize that the aging Archangel Raphael has no intention of giving up his power, even if it means all of Samaria could be destroyed. I feel like the description above is a little bit misleading: this book is more about Rachel, a slave girl who is chosen as the future Archangel’s wife. Almost all of the book deals with how they interact with each other – it felt like a romance book in some ways, but it wasn’t trashy at all – just a lighthearted story with some love involved. I enjoyed it…Rachel was a good character. This is where the story got interesting. It’s 150 years after the first book, and society has advanced enough so that there are factories and primitive cars. Alleya, the new Archangel, tries to figure out why the god can no longer seem to hear them praying anymore. 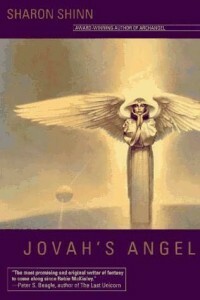 This book goes into much more detail about the god and the way they communicate with him and how the angels came to be. 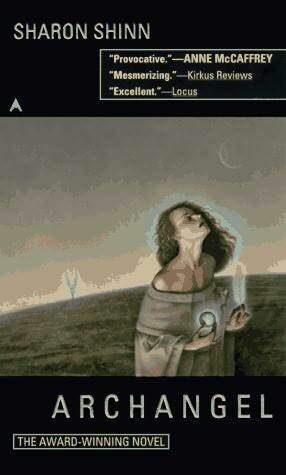 Around the middle of this book it started becoming a sci-fi book. I didn’t feel like Alleya was an especially well-developed character, but it didn’t really bug me too much because the story was interesting enough to keep my attention. Caleb, though, was an awesome character, and I kept thinking as I was reading what a good hero he made. I was sad for this book to end, because I knew from the descriptions that the next book would pick up after all the characters in this one are dead. As the centuries have passed, some of the people of Samaria have begun to suspect that their god Jovah is really a spaceship orbiting the planet. 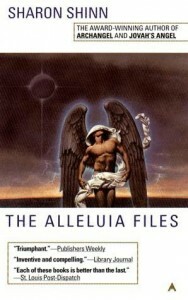 Archangel Bael seeks to destroy the small dissident sect of Jacobites that spreads this heretic philosophy. Bael is particularly interested in arresting one of the young Jacobites named Tamar, but she falls under the protection of the angel Jared, who just might be named the next Archangel. At the same time, the angel Lucinda learns that her mother was a Jacobite—and Lucinda herself might have the key to uncovering the truth about Jovah. OK, now it’s something like 100 years after the last book, and the people who believe that their god is actually a spaceship are being hunted and killed, so they’re all in hiding. There are three main characters in this book: Lucinda (an angel who never really seems that interesting or involved in the storyline), Tamar, a Jacobite who’s in hiding, and Jared, a prominent angel. 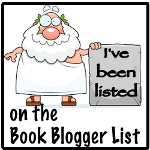 OK, I didn’t enjoy this book much. The disconnect between the characters I’d gotten attached to in Jovah’s Angel and the new characters that are now introduced was just too much – I never really could get into them. It also had a pretty dark theme, with all the hiding and persecution. I was glad when this book ended, and I had a hard time not giving up on it – it took me like 2 weeks to get through. More than a hundred years before Archangel, Samaria is visited at random intervals by mysterious strangers dressed all in black. They appear and disappear, leaving behind fires of utter destruction. The Archangel Gaaron is glad that his new Edori bride, Susannah, is a calm and capable woman who can help him through this crisis, while aiding him in the impossible task of controlling his wild sister Miriam. What Gaaron doesn’t know is that Susannah, who still mourns for her former lover, has a secret connection to the god Jovah—a secret that could save the whole planet. He also doesn’t know that his runaway sister has met one of the invaders and is prepared to risk everything to keep him alive. Aaaaaaaand, the goodness is back. This is the 4th book, but it’s set before the first one. This book was totally, totally interesting, I had a hard time putting it down. Couldn’t wait to find out what was up with the men who were attacking the world. But…it was also perhaps the most annoying one, too. These books are long, and sometimes not a lot happens – there’s not as much action as I would prefer. It’s all “yep, I know I could find out exactly what is going on through a simple conversation, but instead I’m going to fly home to the Eyrie for 3 days and think about my wedding breakfast – here, enjoy a 7-page description of my flight!” It reminded me of Lost, sort of – more thought was put into building the tension than to furthering the story, and if people would just TALK to each other, it could all have been taken care of. For instance, Mahala knew what Susannah had to do – why didn’t she insist that Susannah stay with her? Why in God’s name would Gaaron leave Mount Sinai instead of talking to Mahala about what she’d learned from Jossis???? Also, the whole reveal about why Susannah was important, her “secret connection to the god,” was kind of non-existent. Aaaaaand, finally, the last book. OK, so this book is set a year or so after the first one ended. Elizabeth travels to the new angel hold to try to have an angel baby, and is kind of boring, Obadiah is an angel who doesn’t really have a personality, and then there’s Rebekah, who is sooooo interesting! I loved the Rebekah parts because it was really neat to see her culture. Jansai women aren’t allowed to be seen by men, ever, so they have to stay in their houses at all times and also wear veils. It was terrible, but also cool to read about. Elizabeth didn’t really need to be in the story at all, I didn’t see much point to her. Plus, her love interest is named Rufus. RUFUS. I’m not sure I’d read these again, but I enjoyed them for the most part. 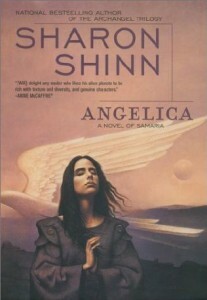 This entry was posted in Sci-Fi and tagged angels, love stories, Samaria, Sci-Fi, Sharon Shinn. Bookmark the permalink. Aaaaand, I think I would totally read these. Their god is a spaceship? The angel thing? Really neat. I assume you had the whole set for Kindle? Expensive? it was really pretty cool. Not the best books ever, but pretty enjoyable, and a really neat world.